For other uses, see Progon (disambiguation). 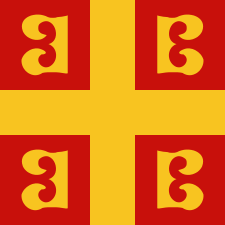 The Progon family (Albanian: Progoni) established the first Albanian state, the Principality of Arbër, which fell under the influence of the Byzantine Empire, the Despotate of Epirus and the Kingdom of Serbia. Progon, the founder, held the title of archon (lord), while one of his sons, Dimitri, held the title of panhypersebastos. The family had a considerable degree of autonomy. The family disappears in historical sources after 1216, following the death of Dimitri. ↑ Clements 1992, p. 31: "By 1190, Byzantium's power had so receded that the archon Progon succeeded in establishing the first Albanian state of the Middle Ages, a principality." ↑ Ducellier 1999, p. 786: "However, owing to the proximity of a Serbia in full expansion and of the Epirote princes, little Arbanon, shut away in the hinterland, with its main political center in Kruja, opted for a continuing attachment to the Orthodox tradition and for subjection to Epiros, as well as alliance to Serbia." Clements, John (1992). Clements' Encyclopedia of World Governments. 10. Dallas, TX: Political Research, Incorporated. Ducellier, Alain (1999). "24(b) – Eastern Europe: Albania, Serbia and Bulgaria". In Abulafia, David. The New Cambridge Medieval History: Volume 5, c.1198 – c.1300. Cambridge: Cambridge University Press. pp. 779–795. ISBN 978-0-52-136289-4.